This dish was born one night several years ago when I had no clue what to make for dinner and just threw in what I had. BAM! We had a winner. I could pretend like all my culinary experiments turn out awesome, but then I would be lying. Only about 1 out of 10 turn into a meal I want to make over and over. Most are okay but not worthy of repeating. And occasionally one will go straight to the chickens…I don’t think they have taste buds. Let’s skip the failures and instead celebrate the successes. Trust me, your gonna love it! Whole, fresh ingredients are what make this dish simply delicious. There are a few ingredients that if substitution is needed it will have an effect on the overall taste. The most important is probably the Parmesan. For the love of your taste buds do not buy the pre-grated Parmesan in a plastic cylinder. I am not sure what it is, but it is not Parmesan. You will most likely not find the real deal at your local grocery store. 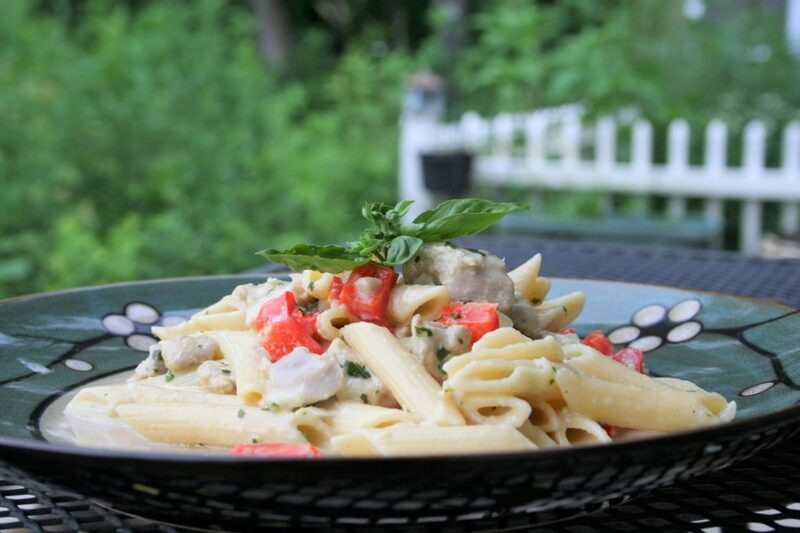 Parmigiano Reggiano can be found at places like Earth Fare and specialty shops. It will be 100% worth your time to find the good stuff. The other would be the pesto. I am sure store bought pesto would work well but homemade is super simple ( just garlic cloves, sea salt, olive oil and fresh basil to taste) and the taste is incomparable. 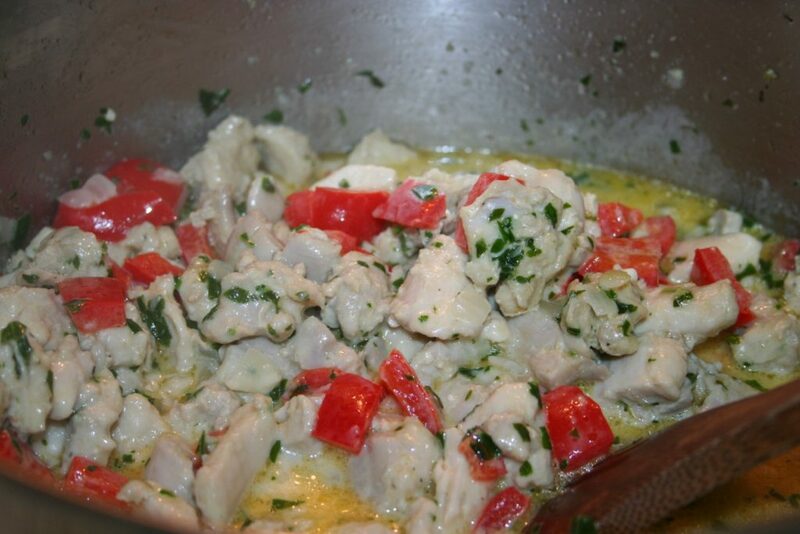 Place butter and the chopped chicken in a large pot and begin cooking on med-high heat. Stir often. I have found that if I am using meat that has been previously frozen there tends to be a large amount of liquid in the bottom of my pot. I usually pour most of it off once the chicken has cooked through and reserve it in case my creamy sauce is too thick and needs to be thinned. 2. 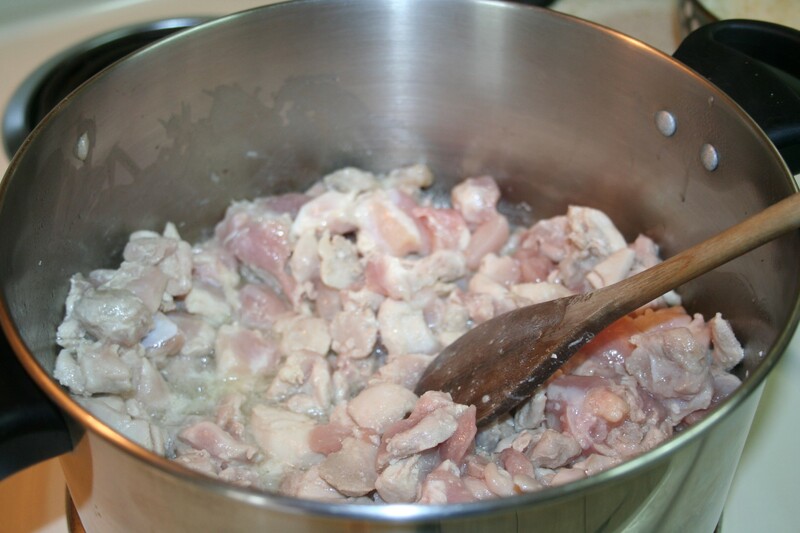 Once chicken is cooked through add in the chopped onion stirring often and cook for 4-5 minutes. Or until the onions become transparent looking. Add in the peppers. You only need to cook these for a about 2-3 minutes. The goal is for them to be tender but still have that fresh from the garden taste. Once the peppers are done cooking add in the fresh basil pesto. 3. 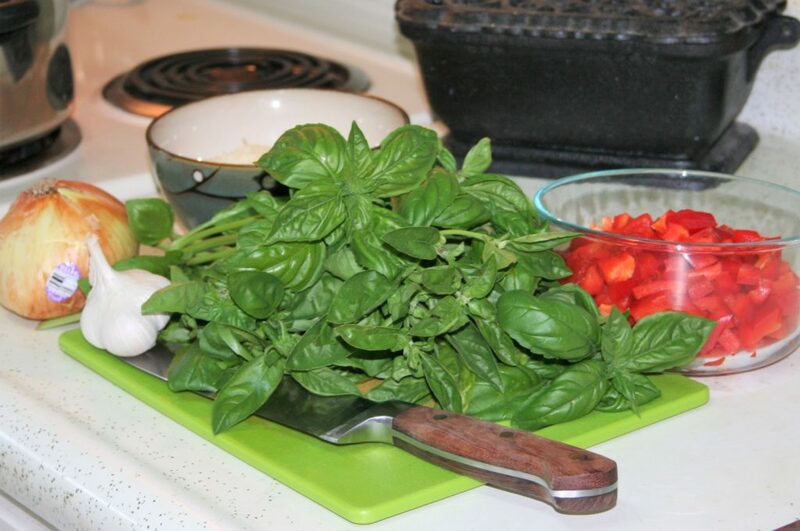 As soon as you put in the basil pesto bring the temperature down to medium-low. Pour in your cup of cream and Parmesan. Stir until combined. Add in the already cooked pasta and salt and pepper to taste. At this point you can decide if you need more basil pesto or a little more cream and reserve chicken broth to make more sauce. All that’s left to do is plate it up! Enjoy!